Diddy Kong Racing for Nintendo 64. Nintendo 64. Nintendo DS. Nintendo NES. Super Nintendo. This item is genuine, original. If you are not happy with it we will work to fix the problem. Just let us know. Star Fox 64 for Nintendo 64. Nintendo 64. Nintendo DS. Nintendo NES. Super Nintendo. Scratched Cover. If you are not happy with it we will work to fix the problem. Just let us know. Snowboard Kids (Nintendo 64, 1997). Condition is Like New. Shipped with USPS First Class Package. N64 NINTENDO POKEMON PUZZLE LEAGUE VIDEO GAME CARTRIDGE pre played. Condition is Very Good. Shipped with USPS media mail Package. Trending at $14.24eBay determines this price through a machine learned model of the product's sale prices within the last 90 days. GoldenEye 007 (Nintendo 64, 1997) - Cartridge Only. Condition is Good. Shipped with USPS First Class Package. Trending at $30.00eBay determines this price through a machine learned model of the product's sale prices within the last 90 days. 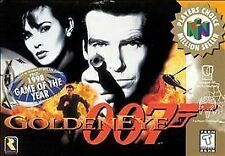 GoldenEye 007 Nintendo Entertainment System N64 Game Cart James Bond. Condition is Good. Shipped with USPS First Class Package. GoldenEye 007 (Nintendo 64, 1997). Condition is Good. Cartridge only Shipped with USPS First Class Package. Turok: Dinosaur Hunter - N64 - GAME ONLY - TESTED AND WORKING. Condition is Very Good. Shipped with USPS First Class Package. Trending at $12.00eBay determines this price through a machine learned model of the product's sale prices within the last 90 days. Working Mario Tennis for N64 Nintendo 64 Game Rated E Everyone Cartridge Only. Condition is Good. Shipped with USPS First Class Package. Star Fox 64 (Nintendo 64, 1997). Condition is Good. Shipped with USPS First Class Package. Trending at $16.23eBay determines this price through a machine learned model of the product's sale prices within the last 90 days. Nintendo 64. Nintendo DS. Nintendo NES. Super Nintendo. If you are not happy with it we will work to fix the problem. Just let us know. Sega Dreamcast. Playstation 3. Snowboard Kids (Nintendo 64, 1997) AUHTHENTIC. Condition is Like New. Shipped with USPS First Class Package. Turok Dinosaur Hunter for Nintendo 64. Nintendo 64. Nintendo DS. Nintendo NES. Super Nintendo. Sega Dreamcast. Playstation 3. Playstation 2. WCW World Tour for Nintendo 64. Nintendo 64. Nintendo DS. Nintendo NES. Super Nintendo. If you are not happy with it we will work to fix the problem. Just let us know. No Case or Instructions. Trending at $11.47eBay determines this price through a machine learned model of the product's sale prices within the last 90 days. Diddy Kong Racing (Nintendo 64, 1997). Condition is Very Good. Shipped with USPS First Class Package. Cleaned and tested copy of Turok: Dinosaur Hunter for N64 consoles. Game plays well. Cartridge shows minimal signs of wear. Compativle with all Nintendo 64 systems. 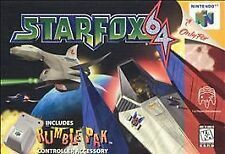 Star Fox 64 game & manual ( no rumble pack included). Condition is excellent. Shipped free with USPS First Class mail to lower 48 only. The Legend of Zelda Ocarina of Time Nintendo 64 Game Cartridge. Condition is Good. Shipped with USPS First Class Package. This game was bought used and works. For Sale: Rampage World Tour N64 ( Nintendo 64, 1997 ) (4/16). I get the notifications for things that are paid for. I have never and will never use photos from anywhere else. NBA HangTime (Nintendo 64, 1997). Condition is Very Good. Diddy Kong Racing (Nintendo 64, 1997) N64 with manual . Condition is Very Good. Shipped with USPS First Class Package. Rampage World Tour (Nintendo 64, 1997) TESTED!!! 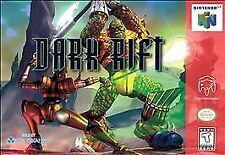 4.5 out of 5 stars - Rampage World Tour (Nintendo 64, 1997) TESTED!!! 44 product ratings44 product ratings - Rampage World Tour (Nintendo 64, 1997) TESTED!!! Will have wear/tear, but will work just like it should! 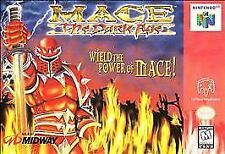 NTSC-USA/CAN Format! 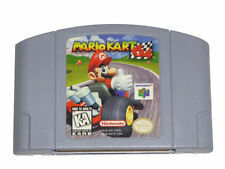 Mario Kart 64 - TESTED AND WORKING - NINTENDO 64. Condition is Very Good. Shipped with USPS First Class Package. No fake labels. Genuine Nintendo boards. Star Fox 64 Nintendo 64 N64 OEM Authentic Video Game Cart Kids Simulation GREAT! 5 out of 5 stars - Star Fox 64 Nintendo 64 N64 OEM Authentic Video Game Cart Kids Simulation GREAT! 288 product ratings288 product ratings - Star Fox 64 Nintendo 64 N64 OEM Authentic Video Game Cart Kids Simulation GREAT! Mario Kart 64 (Nintendo 64, 1997). Condition is Very Good. Cartridge works great. Shipped with USPS First Class Package. Extreme-G (Nintendo 64, 1997). Condition is Good. Shipped with USPS First Class Package. RAMPAGE WORLD TOUR NINTENDO 64 N64. Condition is Very Good. Shipped with USPS First Class Package. Mischief Makers (Nintendo 64, 1997) COMPLETE NICE LOOK!!! Hello ebayers! Up for sale is the following Nintendo 64 game. The game is tested and working perfectly. Exactly what you see is exactly what you get so please buy with confidence!!! 5 out of 5 stars - Mischief Makers (Nintendo 64, 1997) COMPLETE NICE LOOK!!! 8 product ratings8 product ratings - Mischief Makers (Nintendo 64, 1997) COMPLETE NICE LOOK!!! ID NUMBER #108 (STAFF USE ONLY). San Francisco Rush Extreme Racing (Nintendo 64, 1997) N64. Condition is Good. Shipped with USPS First Class Package. 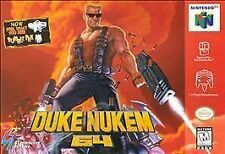 Battle Tanx Global Assault Nintendo 64 N64 Video Game Cartridge Tested Good! This has been cleaned, tested, and works great. These will have physical wear/tear, but will work just like they should! NTSC-USA/CAN Format. GoldenEye 007 (Nintendo 64, 1997). Condition is Very Good. Shipped with USPS First Class Package. MARIO KART 64. Nintendo 64. See photos for condition. NFL Blitz is the NFL at its finest, featuring easy to run plays and unparalleled action, all in breakneck speed. In Season mode, you can play out the real '98 NFL football schedule. You might play in rain, snow or mud. Gauntlet Legends Nintendo 64 N64 Genuine Authentic 1997. Condition is Good. Shipped with USPS First Class Package. Turok Dinosaur Hunter Nintendo 64 N64 OEM Video Game Cart Authentic Retro GREAT!